[prMac.com] Newark, Delaware - Night Productions is proud to announce Pref Setter 2.0, an update to their widely known application. Pref Setter is a powerful utility for editing property list files, geared towards viewing and editing Mac OS X's preference files. Pref Setter's intuitive and easy to use interface streamlines the user's experience and lets them get right to editing without needing to take time out to learn how to use it. Version 2.0 adds support for authentication, the ability to launch or quit applications directly, a new hex editor for editing data values, significantly updates the appearance, fixes bugs, and more. All users are encouraged to update. *Easy access to all of your preference files. *Comprehensive drag and drop support. *Ability to import "defaults write..." strings directly without needing a trip to the terminal. 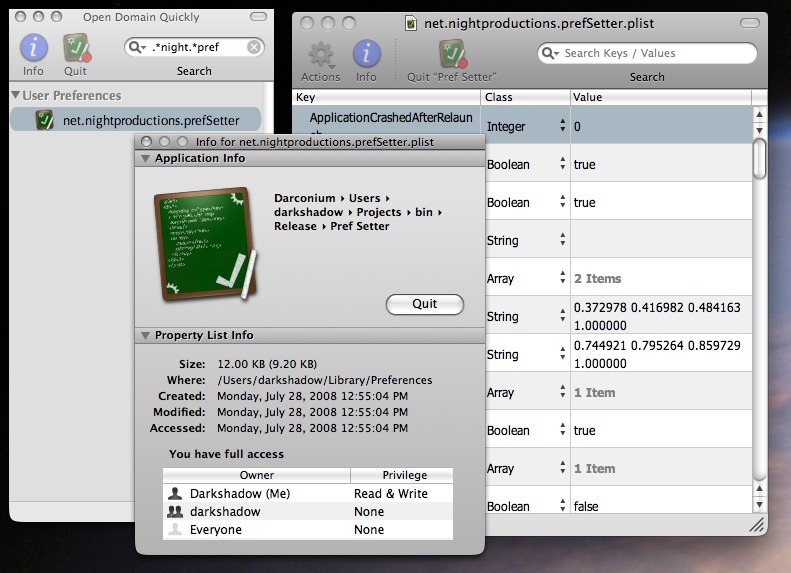 Visit Night Production's to learn more about Pref Setter and to download the new version. Pref Setter is freeware, though donations are welcome. Night Productions is an independent software vender founded in 2003 by Michael Nickerson. Night Production's aim is to create easy to use software that is intuitive and a joy to use.